Celebrate the American spirit in classic American colors with this 4th of July Paper Flower Craft for kids, perfect for Independence Day! I’ve always been fascinated by the stories behind flags. Most of them have gone through series of transformations to reach the way they look today. If you dig deep, you’ll find some amazing stories! I admit I don’t know much about flag history besides that of the Indian tricolor. However, the American flag is something many of us here are familiar with, thanks to Hollywood and TV Shows! And since next month is the American Independence Day, it’s a good time to look at what’s the story behind the red, white and blue. For instance, did you know that the flag was modified 26 times to end up looking like the flag it is today? Yes, that’s a lot! So if you’re ready to celebrate the American classic colors, you can check out our list of fun 4th of July DIY centerpieces. 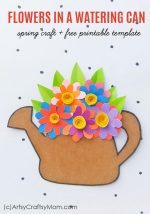 And if you’d like something to kick start your crafting process, check out today’s 4th of July Paper Flower Craft for Kids! 1. Let’s start by getting our pieces ready based on the template as shown in the picture. 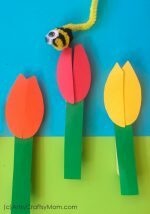 For one flower, you’ll have a zig zag strip, thin strips of an alternate color, a green strip and shapes of a flower, leaf and circle. 2. Arrange the thin strips at equal angles to each other, securing the center with glue. Fold each end towards the center and stick in place. Repeat till all ends have been folded. 3. Take the strip with the zigzag edge and start creating accordion folds along the length of the strip. The zigzag edge can help you create neat and even accordion folds. 4. Keep folding till you reach the end of the strip. 5. Join the two ends of the strip with glue so you get an accordion folded ring with a straight edge on the bottom and a zig zag edge on top. 6. Pinch or gather together the straight edge so that the zig zag edge flares outward in a circle. Press gently to flatten the flower. 7. Cut out 2 small circles from craft paper. 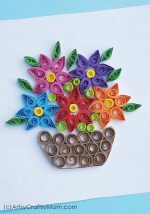 Stick each one in the center of the accordion flower, on either side. 8. Roll the thin blue strip into a right coil. Cut out more shapes – a white flower, green stem and green leaf. 9. Stick the white flower shape on top of the accordion flower. Stick the red strip flower on top of this, ensuring that the petals of the two flowers appear in an alternate pattern with each other. 10. Glue the rolled coil on the center of the last pattern. And finally attach the flower pattern on the top end of the stem with the leaf attached to it. Ta da!! 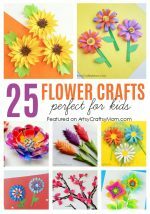 Your 4th of July Paper Flower Craft is ready! Now that’s a pretty way to celebrate the red, white and blue, isn’t it? I like the fact that you can use different shades of blue and red to create different looks for the same 4th of July Paper Flower craft. 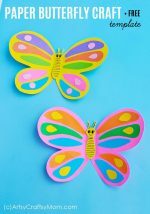 And once you’ve cut out the pieces, even little kids can help assemble it together – making it a fun family project!